It is spring in Mugenri. There is groundless rumor that nobody knew the source of but making quite a stir; When the time comes that bad ideas blend with pride, the Heavens will divide the Mirror. Some drunkards heard the "divide the mirror" part and soared through Mugenri's skies because they thought it would rain free saké. Len'en Ten'eisenki is the fourth game in Len'en project. 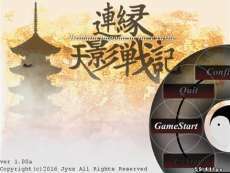 Brilliant pagoda or Haze Castle plays like a typical Len'en Project game, but consists of several new mechanics. The most distinctive part is cell system, where each stage consists of random formation of enemies as well as sub-events. Player can choose any direction they want using their movement, which leads to different cells. Stages are divided in red, purple and blue sections. The color of the section that the last cell player enter determines the boss and which stage player move on to next. Brilliant pagoda or haze castle has four teams for a total of 12 playable characters, each has their own shot type and bombs, as well as different movement speeds.